Abu Dhabi, UAE, 1 April 2015: Experts have highlighted Turkey as one of the most attractive real estate investment destinations in the region, due to its increased Gross Domestic Product and strong economic growth. With an average GDP growth of 3.6% and a 55.6% year-on-year increase in property sales to foreigners in 2014, Turkey has tripled the size of its economy reaching US$813billion and is now the 16th largest economy in the world. 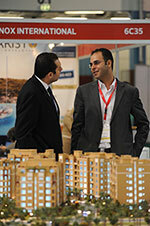 In parallel to this trend, Turkey has the largest international presence at this year’s Cityscape Abu Dhabi. Wouter Molman, Director of Cityscape Group at Informa Exhibitions, the organisers of Cityscape Abu Dhabi, said: “Mirroring the strength and growth currently observed in the market place, we are thrilled to witness the strong presence of Turkish companies on the exhibition floor. GCC and foreign investors will be able to capitalise on the wealth of global investment opportunities at the 9th edition of Cityscape Abu Dhabi, which takes place on 21-23 April at the Abu Dhabi National Exhibition Centre. Senior management from New Life Turkey, a first time exhibitor at Cityscape Abu Dhabi, believe that their presence at the event is an absolute must as they witness a rapid growth in the market. Wissam Abou Chahine, General Manager of New Life Turkey said: “In the last 12 months we’ve started to accommodate the Arabic market. Along with the expansion of our office space and our after sales services, we have appointed a new Arabic speaking team specifically catering to the needs of the MENA region. Continuing its strong international feel, participation from Jordanian exhibitors has also grown, as thousands of visitors, investors and developers from around the world prepare to descend upon the show. Other countries represented include Cayman Islands, Egypt, Kuwait, Latvia, Nigeria, Portugal, Serbia, Thailand, United Kingdom and United States. The three-day event is held under the patronage of His Highness Sheikh Mohamed bin Zayed Al Nahyan, Crown Prince of Abu Dhabi and Deputy Supreme Commander of the UAE Armed Forces. After a successful launch edition last year, the Abu Dhabi Market Overview Forum returns on the opening day (21 April), hosted in collaboration with JLL and supported by Masdar City. The half day Forum will draw attention to the Emirate’s latest trends and initiatives, including future developments and anticipated new real estate regulations. Cityscape Abu Dhabi 2015 returns with support from Strategic Partner Department of Municipal Affairs (DMA), Platinum Sponsor Wahat Al Zaweya, Silver Sponsor Farglory, Official VIP Sponsor Ejadah Asset Management Group and Official Mortgage Provider Abu Dhabi Finance. For more information, go to www.cityscapeabudhabi.com or call +9714 336 5161.